If there's a theme of 2013, it's been "don't post it on the Internet." Add another entry to the file: this asshat biker in Pennsylvania posted GoPro video of him running from the cops. 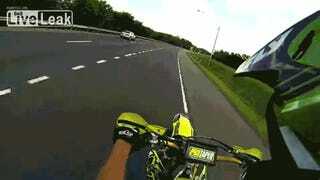 The video shows one dirt bike rider on Pennsylvania Route 424 pulling wheelies at highway speeds when he spots a cop waiting by an offramp. Does the biker stop? No. He and the other two riders he's with keep on speeding, passing traffic on the shoulder, all while pulling more wheelies across the median. The video ends with the biker disappearing onto a rural dirt track leading into the woods. This is what the biker might call "badass" and what the police might call "evidence." This chase vid is reminiscent of the last time bikers posted video of them getting reckless on public highways, the now-infamous NYC attack/chase video that involved multiple arrests, including a number of undercover cops. It took the NYPD a couple weeks to figure out exactly who was involved in attacking Alexian Lien. Time will tell how long it will take before this biker is unmasked.